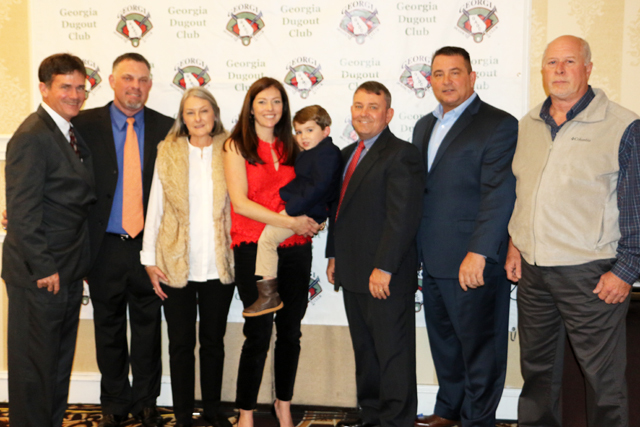 The Georgia Dugout Club inducted six new members into its Hall of Fame on Friday. The newest members are (l-r) Mill Creek coach Doug Jones, Parkview coach Chan Brown, Kathy Kurtz (for John Kurtz), Kauleen Thatcher (for John Kurtz), Walton coach Shane Amos, Mercer coach Craig Gibson and former Brunswick coach Charles Skipper. MARIETTA -- Brad Porter thanked his family, countless mentors and many of his former players Friday afternoon behind the podium. But as he began to conclude his speech, there was one special person he didn't want to leave out. "My mother, who will be gone 15 years next week, taught me so much to help make me a better man," said the Valdosta High School coach. "If you're listening mom, I accept this in your name." 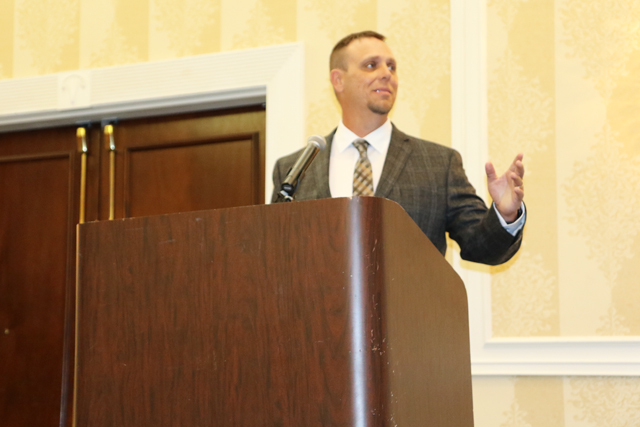 Porter was presented the Ethics in Coaching Award at the Georgia Dugout Club's annual Coaches Clinic at the Marietta Hilton Hotel & Conference Center. He was presented the highest award on Friday, while the Dugout Club inducted six new members into its Hall of Fame -- the late Georgia College coach John Kurtz, former Brunswick coach Charles Skipper, Mercer University coach Craig Gibson, Mill Creek coach Doug Jones, Parkview coach Chan Brown and Walton coach Shane Amos. Kurtz's family (wife Kathy, daughter Kauleen Thatcher and grandson Cooper Thatcher) accepted the Hall of Fame award on behalf of the legendary Bobcat coach, who guided the Georgia College program for 18 seasons. He passed away in the fall of 1993 at practice. He compiled a 577-369-4 record, leading the Bobcats from 1976 to 1993. He led the program to seven Georgia Intercollegiate Athletic Conference Championships and four NAIA District 25 titles. He guided two of his teams (1984 and 1985) to the NAIA World Series. Jones was introduced by longtime Parkview coach Hugh Buchanan. "He's probably the most uncomfortable person in this room," Buchanan said. With the exception of one season where Jones was an assistant football and baseball coach at Jackson County, he has spent most of his life playing and coaching football and baseball in Gwinnett County. He boasts a career 400-214 record as a head coach at Brookwood and Mill Creek. "Coaching baseball is like a ministry to me," Jones said. "It's a calling. It's what God has called me to do. We've had some bumps and bruises along the way, but we've made it." A standout athlete under legendary baseball coach Donnie English at Osborne High School, Amos was introduced by his high school mentor. As a head baseball coach at Pebblebrook and Walton, Amos holds a 348-181 coaching record. He took Walton to state titles in 2007 and in 2016 while playing in the state's highest classification. Skipper kept the audience laughing with his stories. He began his coaching career at Brunswick High School in 1984 as a volunteer assistant while student teaching. He assumed full-time duties in 1985 and remained at the school for the next 28 years. He was an assistant to legendary Brunswick coach Jimmy Brown, who introduced his longtime assistant. When Brown retired, Skipper took over and guided the program for five years. During Skipper's 28 seasons, he coached in 648 varsity and more than 300 sub-varsity games. He helped more than 35 players continue their careers in college. Gibson was introduced his son Tyler. Since taking over for long-time skipper Barry Myers in 2004, Gibson has guided the Bears from the depths of the Atlantic Sun Conference to the top of the SoCon as one of the most respected programs in the southeast including an unprecedented run over the last eight years. Under Gibson’s tutelage, Mercer has set a program record with eight-straight seasons of 35 wins or more. Gibson holds a 470-331 career coaching mark. Brown has continued to keep Parkview among the state's elite since taking over for Buchanan in 2005. He holds a career coaching mark of 375-137 and has guided the Panthers to three state titles. His 2012 and 2015 state championship teams were also named national champions by several media outlets. He has coached in several national events. In 2013, he was head coach of the East squad in the Perfect Game All-American Classic. He also led the Team USA 15U squad to a gold medal in the Pan Am Games in 2013. Brown also guided Team USA 15U to a silver medal in the World Games in Mexico in 2014. The Dugout Club also honored its state players and coaches of the year, while presenting plaques to coaches for milestone wins. Valdosta High School coach Brad Porter speaks Friday after receiving the Ethics in Coaching award at the Georgia Dugout Club Coaches Clinic at the Marietta Hilton.